To call American Audio’s new Versadeck a “MIDI Controller” is like calling a Porsche a small car. Sure this 2-channel unit, which comes bundled with Virtual DJ LE software, can be used by DJs for controlling digital MIDI-based tracks – but its outstanding quality, revved-up performance and many upscale features put it in a class by itself, just like the legendary German automobile. For starters the Versadeck is, like its name suggests, an incredibly versa-tile piece of gear. It features two “MIDILOG” channels ( MIDI and Analog switchable), and comes equipped with two USB slots for thumb drives or hard drives, plus two line inputs for hooking up external CD players or other RCA input devices. This means that no matter how you do your DJ-ing – with a computer, a conventional analog player, or some of both – the Versadeck has you covered, adapting easily to your style. Whether you’re a computer veteran or a newcomer to the digital world, you’ll be equally at home on the Versadeck. Its built-in Virtual DJ LE software is so easy to use that even “newbies” will be able to get started right out of the box. Prefer to use another DJ software program? No problem --the Versadeck is so versatile, it works with all other major brands of DJ software, too. Regardless of what type of music media and/ or software you use, the Versadeck’s awesome, easy-to-use features will take your performance to the next level. Its large scratch wheels make it easy to catch cues, for on-target, precision scratching. Along with Scratch, there are 4 other cool on-board DSP effects -- Echo, Flange, Filter and Skid – plus the unit has a built-in Sound Card and Sound Engine. 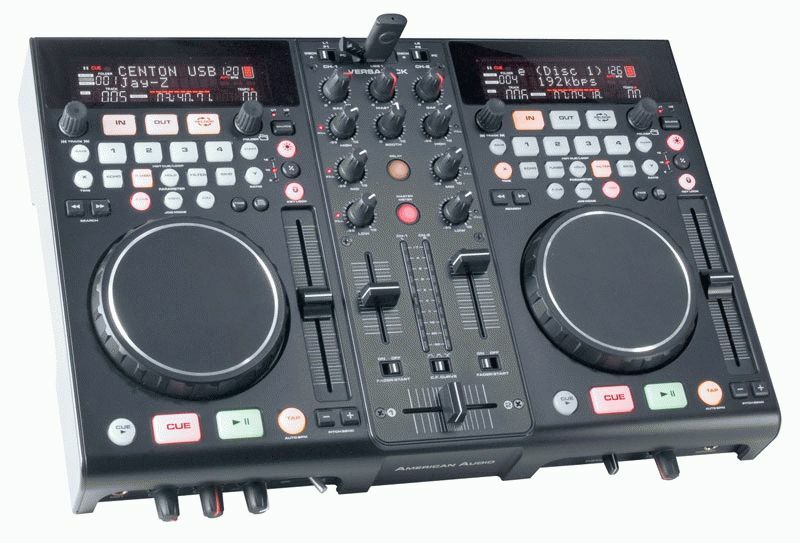 The Versadeck also features Seamless Loop with editable out point, and 4 Hot Cue Buttons or Loop Banks. Its sample banks can hold samples from USB input or trigger them from the software. The Versadeck puts many other tools in your hands too, including an Auto BPM Counter, Fader Start, 3-Band EQ, Key Lock, and Pitch Controls on each deck with a wide Pitch Adjustment of +/-100%. Its Relay Playback feature allows you to set up a playlist in Virtual DJ LE, and have it play back and forth from one channel to the next, so you don’t even have to stay at your station to stay in the mix! Another user-friendly feature is a large VFD display that’s easy to see from a wide angle, even when you’re performing in a dark club. The screen features 2 lines of text for displaying track name and information, and other important functions. There’s also a convenient Track Folder that allows DJs to quickly search through their library and find the track they want in seconds. Additionally, the Versadeck also comes equipped with the company’s exclusive American Audio Database Builder (computer specifications required), a complete music management system that lets you search your database by Title, Artist, Album and Genre. “The Versadeck is the ideal solution for entertainers who are looking for a high-quality MIDI controller,” said Tom Freret, national sales manager for American Audio. “It’s that -- and so much more – all at a very affordable price. It combines the controller and mixer functionality in one unit. It comes bundled with the very popular and easy-to-use Virtual DJ LE software, plus its two channels can be switched to your PC, so you can control them with other DJ software, or you can switch to a line or phono to control CD players and turntables. Other features on the Versadeck include: 2 Mic Inputs with tone control and Talkover, Balanced XLY Outputs, 3 Crossfader Curve Adjustments, and Multi-Voltage Operation (AC 100-240V, 50-60Hz). The unit measures a compact 16.5”L x 11.75”W x 3.5”H/ 420 x 299 x 89 mm, and weighs 10 lbs./ 4.4 kg. The MSRP of the Versadeck is $739.95.